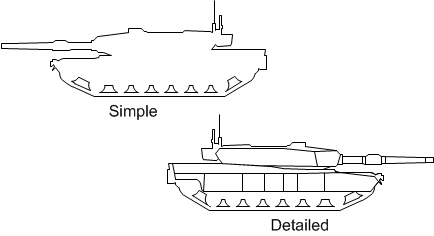 A customer recently saw the Battle Zone post, and contacted me regarding “tank shapes” for Visio. 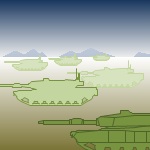 I had made a rather detailed tank illustration long ago, which you can see on the Visio Art Page, but that was a bit overkill for them. Plus they wanted something that looked like an M1 Abrams main battle tank. So I whipped out Visio 2010 and quickly traced over an image I found on my favorite search engine. After a bit of cleanup and the addition of some basic features, I came up with the Visio Tank Shapes for your downloading and diagramming pleasure! 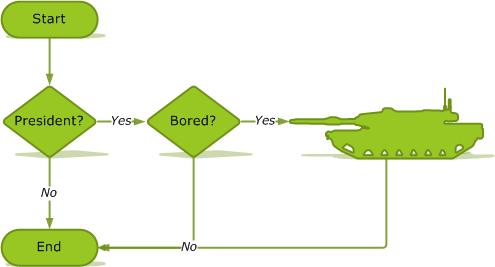 I’m not really sure what you might want to do with tank shapes in Visio. I added connection points on the left, top, right and bottom sides of the shapes, which will help if you do use them in connected diagrams. When you drop a tank onto a page, use the Format Painter tool to make them look like the other shapes. This will ensure that they respond better to themes, and that the text style and size matches that of the other flowchart shapes. Or team them up with the Battle Zone Theme Template, just because you can! The download will be available shortly, tanks for your patience! I like so much!!! you have airplanes or airships , too? Then I just decided to turn it into a simpler shape because I knew that some people used Visio for military planning and military gaming planning. But I don’t have any other related shapes available.